Here’s another recipe to help you hit your 5-a-day. 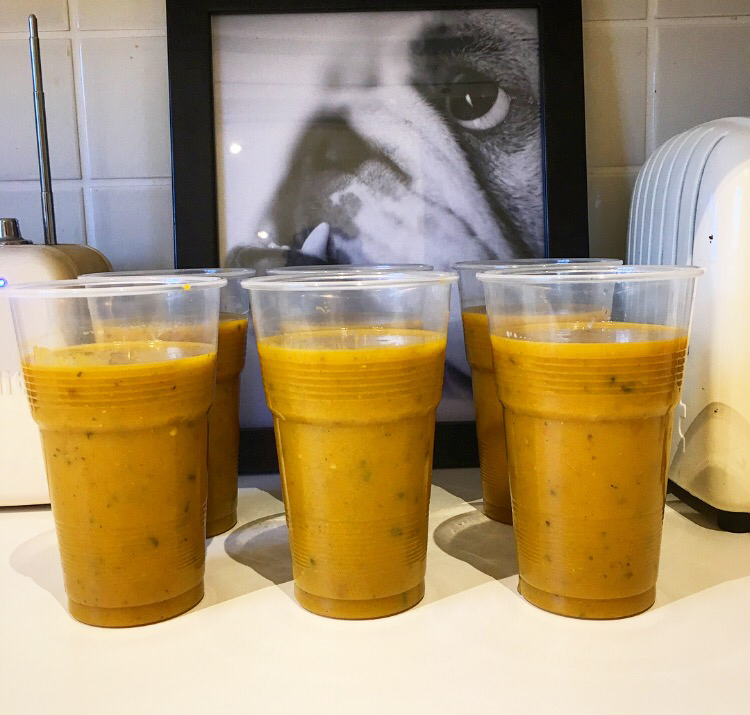 This recipe makes a huge batch of soup making it great for feeding a crowd or what I like to do is stock up on healthy lunches for during the week, it means I can eat well even when I’m really busy. It will happily keep in the fridge for 4-5 days and the best bit is the flavours actually improve. It also freezes really well. To make sure I don’t get bored of eating the same thing everyday I like to add something different to my soup each day. You can grab a pack of ready cooked chicken or prawns from the supermarket or keep any leftovers from the night before. 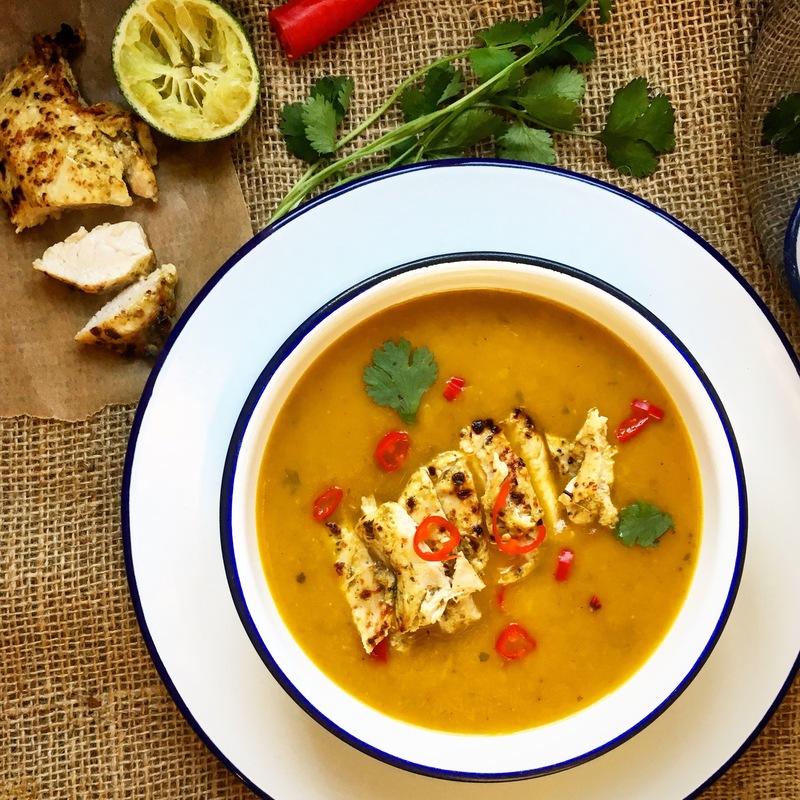 Sliced turkey, shredded ham or cubes of halloumi work really well if you want to incorporate some protein or try some toasted seeds and warm nann bread for dunking! This is full of delicious and nutritious vegetables, spices and fresh herbs to keep your mind and body fighting fit. The sweet potato and squash contain carotenoids, such as Beta-carotene, that are very important as they help to keep our eyes healthy and can prevent or reduce age related degeneration. They’re also high in fibre, good for our hearts and contain high levels of potassium, which is important for healthy bones. 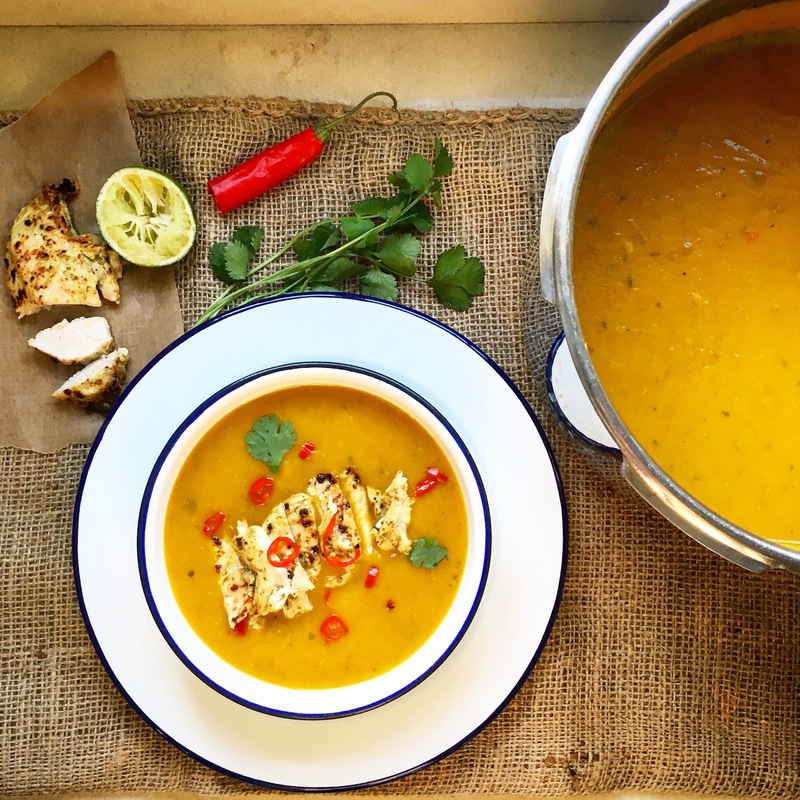 Turmeric has been described as one of the most powerful herbs on the planet, it has antibacterial, anti-inflammatory, anti-carcinogenic, antifungal and antidepressant properties so is a great addition to this soup! Coconuts are highly nutritious, and tasty, they’re rich in lots of vitamins and minerals such as iron and calcium and unlike cows milk it is lactose free. 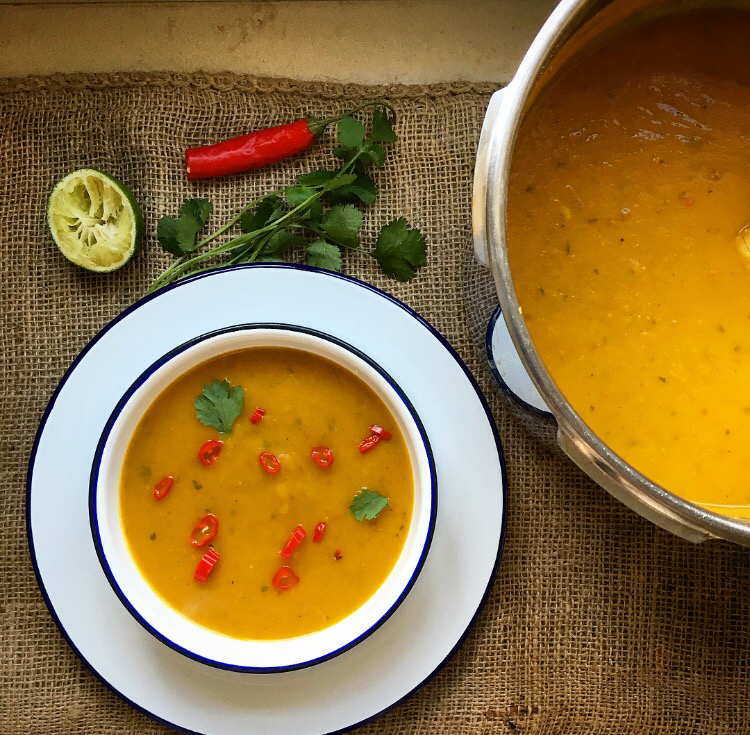 I like to have a really big bowl of soup to keep me full all afternoon, this recipe will give you seven 500ml portions or even more smaller portions. Keep them in the fridge in disposable pint glasses with cling film on the top to save on tuppawear! Roasting the squash first really helps to deepen the flavours in the soup however you could skip this part and just add the vegetables when you add the liquid. 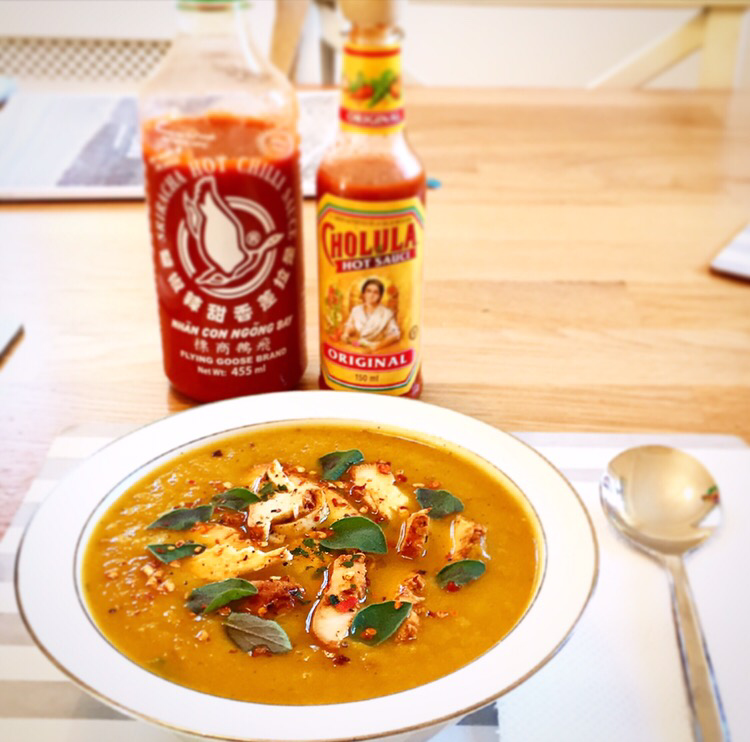 I hope you enjoy this recipe- it’s souper healthy (sorry) – proper good mood food- Happy cooking! Heat oven to 220C/200C fan/gas 6. Put the squash, peppers and sweet potato in a large roasting tin. Drizzle with oil and season well with salt and pepper and a pinch of the tandoori spice mix then roast for about 30 minutes, turning halfway through, until cooked, tender and golden brown. Meanwhile heat a little oil and a pinch of salt in a very large saucepan or pressure cooker pan and soften the onions, celery, leeks and carrots, stirring often for 15 minutes. Add a splash of water if they start to stick. Add the garlic & ginger puree and the remaining spices and stir well. 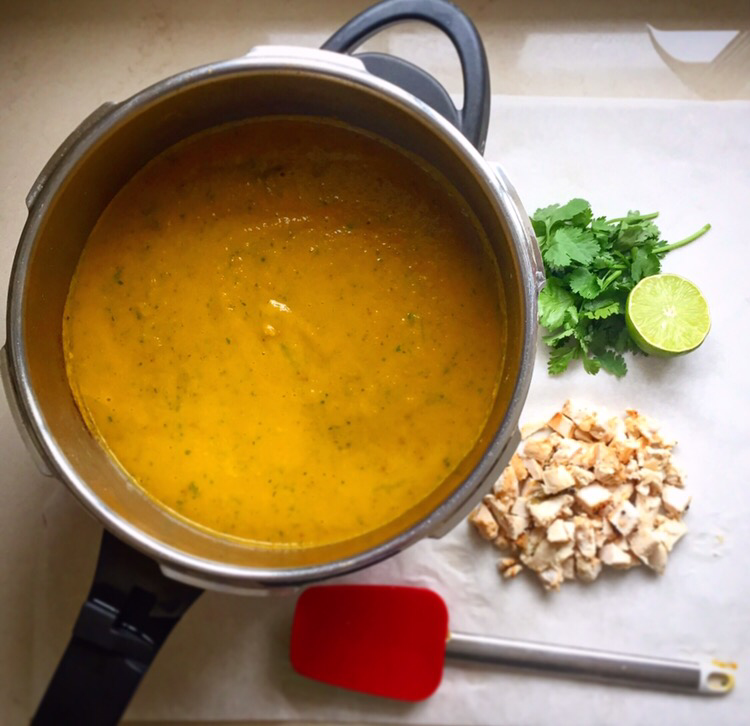 Cook for 1 minute then add the mango chutney, coconut milk, stock pots and bring to a simmer. When the veg is roasted tip into the pan and add enough water to cover the veg, about 1-1.2 litres. Bring up to a simmer. Simmer until the veg is really tender or pressure cook on high for 10 minutes, fast reduced the pressure and then remove the lid. Blend with the coriander until smooth, add a little more water now if it’s too thick and add the lime juice, taste and season if necessary. Serve with extra coriander and sliced red chilli, if you like.